Between May 7, 2013, and May 5, 2014, Kolkata Knight Riders played 12 Twenty20 matches, won four and lost eight (including a tied game against Rajasthan Royals which they lost in the one-over eliminator). Going into their IPL game against Delhi Daredevils on May 7, 2014, KKR were on a four-match losing streak, including another close loss to Royals a couple of days earlier, when they were 121 without loss in 14 overs chasing 171, only to fall short by ten runs. Thus, going into that game against Daredevils, there was nothing to suggest a turnaround. As it transpired, that shocking defeat did inspire a turnaround, as they trounced Daredevils by eight wickets, and haven't looked back since, winning 11 more games in succession to be on a 12-match winning streak, the fourth-best in Twenty20 matches. Knight Riders have always been a strong bowling unit, but their problem had often been the batting. The tables below bear that out: in the 12 games before their recent winning streak, they had a better bowling average, economy rate, and also took more wickets. However, the difference in the last 12 games - and it's a huge difference - has been the batting. Between May 7, 2013, and May 5, 2014, Knight Riders averaged 19.76 runs per wicket, and 7.21 runs per over, with the bat. In the last 12 games, the improvement in the batting numbers has been remarkable - the average has leapt to 34, while the run rate has risen significantly to 8.63 per over. A comparison between Knight Riders' top batsmen during these two periods further highlights the difference in batting firepower. In the earlier 12 games, two of their top four run-scorers made their runs at less than a run a ball. With both Jacques Kallis and Gautam Gambhir batting in the top three, this clearly impacted the team's ability to get off to quick starts. In their last 12 games, Robin Uthappa's form has made a huge difference: he has scored 520 runs at a 50-plus average and a strike rate of almost 150, which is significantly more than what any of his team-mates have managed. With him batting at the top of the order, it's given KKR the sort of early momentum that they almost never had in the matches before. While Uthappa has made a huge difference, there have also been vital hands played by the middle and lower-order batsmen. Shakib Al Hasan has scored some vital runs, and got them quickly, while Suryakumar Yadav has been outstanding in finishing off games, most recently against Perth Scorchers in the Champions League on Wednesday, when he scored an unbeaten 43 from 19 balls. Ten of the 12 wins in a row for Knight Riders have come in chases, and in some of them the middle and lower-middle order have played handy roles. That four of their top seven run-getters in these 12 matches have strike rates of more than 145 indicates how effective their batting has been. 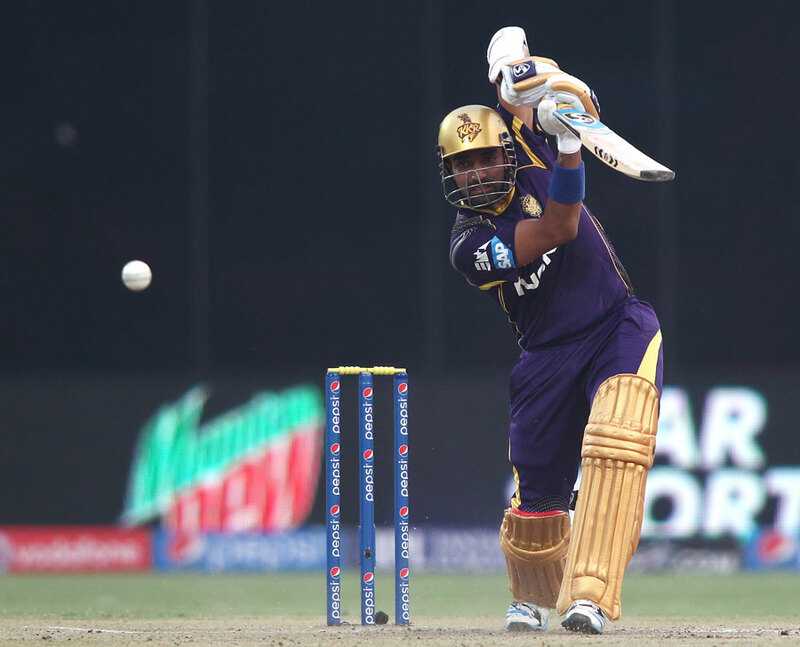 With Uthappa in such sublime form, and Gambhir contributing a few as well, Knight Riders' opening partnerships have taken off, and that's contributed significantly to their improved fortunes. In the 12 matches they've won on the trot, they've averaged close to 40 per partnership, at a run rate of almost eight per over; in the previous 12 they'd averaged 22 at a run rate of seven. In their 12 in a row, KKR's opening partnership has yielded 40 or more runs six times - 106, 100, 68, 64, 50, and 43. In contrast, there were only two opening stands of more than 25 in the previous 12 games, when KKR had a 4-8 win-loss record. The highest was 121-run stand in that disastrous loss against Royals, while the next-best was 45 against Pune Warriors. The better starts have also helped with the scoring rates later in the innings, with both the average and the scoring rate in the middle and end overs being much higher for Knight Riders in their last 12 games than the previous set of 12. In percentage terms, though, the improvement in the first six has been the greatest - 106% in terms of the average, 27% in terms of run rate. And while the improvement in batting has made all the difference, Knight Riders should also be thankful that the bowlers have maintained the high standards that they've always set. Sunil Narine has been outstanding as usual - when isn't he, in this format? - and he has had some strong support in recent games from Piyush Chawla. The consistency of the bowlers - especially Narine in the death overs - has allowed Knight Riders to bowl first most of the times when they win the toss, knowing that they will restrict the opposition to a manageable total. The improvement in the batting has then allowed them to chase it down every time. It's a formula that worked well in the second half of the IPL, and has worked well so far in the Champions League. Clearly, they're the team to beat in this tournament.